The first recorded exploration of Twentynine Palms was made in 1855 by desert surveyor Colonel Henry Washington. He found Native Americans, principally from the Chemeheuvi tribe, living in the surrounding hills and near the spring they called “Mar-rah,” meaning “land of little water.” The spring, which is now called the Oasis of Mara, is located on the grounds of the historic 29 Palms Inn adjacent to Joshua Tree National Park Headquarters and Oasis Visitor Center. The early Native American inhabitants (Serrano, Chemheuvi, and Cahuilla) were followed in the 1870s by prospectors in search of gold. The Oasis of Mara was a favorite camping spot. There, prospectors would rest and replenish their water supplies before venturing farther into the unknown desert. The area was then generally known as Palms Springs. Legend says that the name of Twentynine Palms was first used by these gold miners because of the 29 Washingtonia filifera palm trees surrounding the Oasis, and in fact the area was designated as such in the description of a mining claim by two partners known as McKenzie and Germain, who stated that their claim was a certain distance from 29 Palms Springs. However, it is also known that an A.P. Green, a member of an 1858 survey party, reported that there were 26, not 29, fine, large palm trees at the oasis. There are many stories told of the derivation of our present name, including one that claims that it was Colonel Washington who named it for the number of palm trees he found at the oasis at the time of his 1855 survey, but this has never been authenticated. In the 1870s, local Native Americans led prospectors to locations south and east of the oasis where gold had been found. Thus, mining began in the area that later became known as Gold Park. It was not long before freighters were hauling supplies to be used not only in the Gold Park District, but also in the Dale Mining District east of Twentynine Palms, where other valuable deposits had been located. Gold mining continued sporadically through the following years, but ended about the time of the onset of World War I, when no further new ore deposit discoveries were occurring. After the war, many veterans returned to their homes suffering from tuberculosis and the effects of the mustard gas that had been used in combat. Dr. James B. Luckie from Pasadena, California, treated many of these men and in the 1920s began to search for an area in the California desert that would provide a beneficial environment for people afflicted with respiratory and heart ailments. After visiting many places, he chose Twentynine Palms because it had a moderate elevation and clean dry air, as well as being accessible to large cities. Veterans brought their families and began homesteading the 160-acre parcels then made available to settlers by the federal government at no cost. 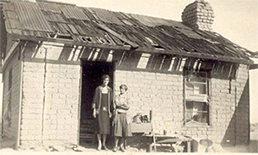 It was this homesteading that determined the widespread area that is Twentynine Palms today. History, of course, is what we all make each day in our everyday lives, and Twentynine Palms has never lost its pioneer spirit as it has progressed. That spirit is catching and affects many who have chosen to make their home here and have joined with the original families (and their second and third generations) in actively supporting the goals of the community.